Though I've traveled extensively, once in awhile I will do things without preparation. So I find myself in unfavorable situations and there's no one else to blame but me. 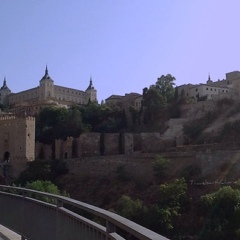 Now I know never to walk around the walled city of Toledo without a map unless my plan is to happily get lost along its narrow and winding cobblestone streets. The Castilla region was also experiencing an extraordinary heat wave during my visit. So there I was walking in circles when the temperature was roaring past the 100° F mark.